Mr Yu introduced me to a new breakfast. I seen it many times before but I never tried it. That mi ger shop at Chiayi also offered this. I never realised it was so delicious. And then I was driven to the High Speed train station. 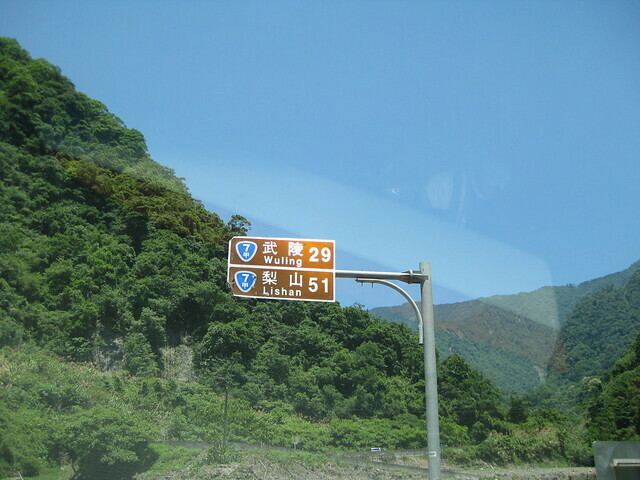 I came back to Taipei around 10am on 7th July. I could have stayed in Chiayi longer but that would only be prolonging the inevitable departure. In about blink of an eye, an entire week with Tink just passed by. I could have written more. On the rides I took through the padi fields of Chiayi, the proprietors of so many shops who were so happy to see me again. With them, we went way beyond proprietor and customer. We became old friends. Resulting in many arguments when I felt they undercharged me. 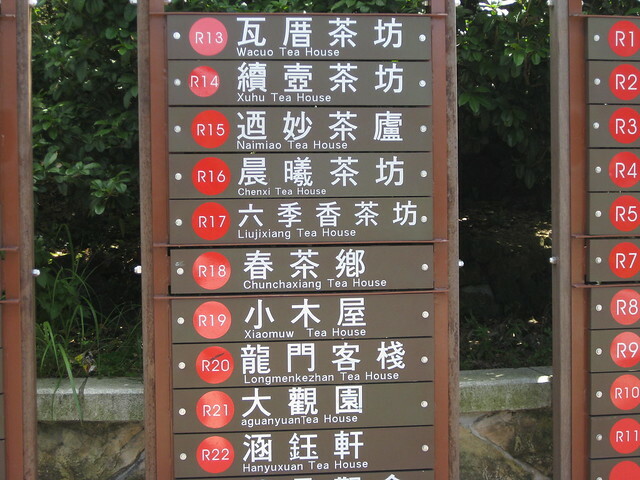 I checked into an inexpensive hotel near the hotel I normally stayed near the SungShan railway station. At 1000NT a night, the hotel was good value for money. The hotel was also near the Roa Her night market, full of stalls selling wonderful titbits and food together with other colorful stalls selling all kinds of clothings and knicknacks. The Internet cafe I normally used became a thing of the past. That place was completely razed. 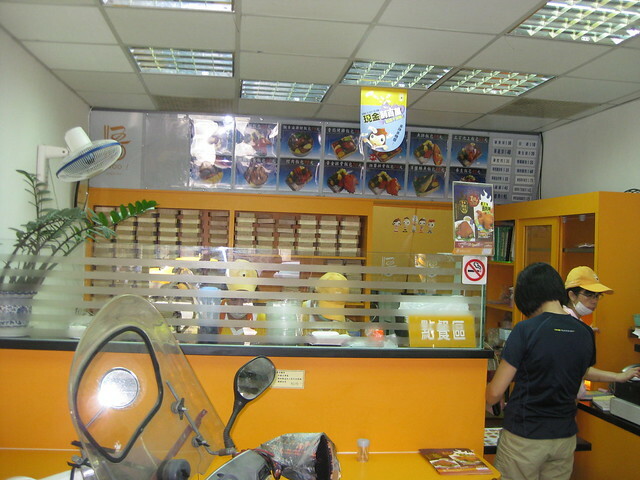 Apparently there were no more Internet cafe of any kind in Taipei. 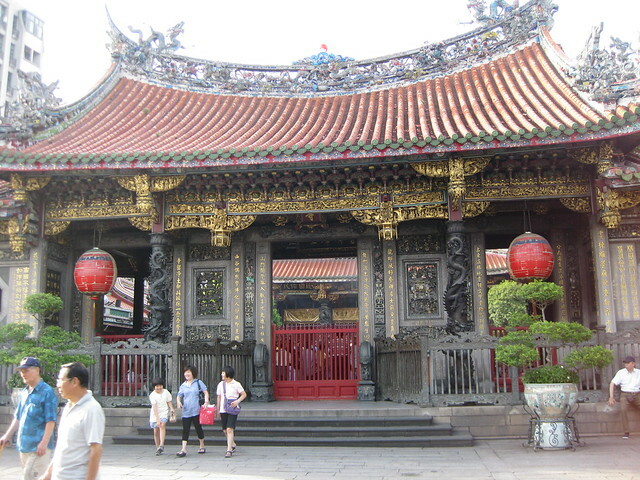 Or perhaps in Chiayi even. Not as if I could use Internet cafe then. Evenings in Chiayi were so full of going out with friends. 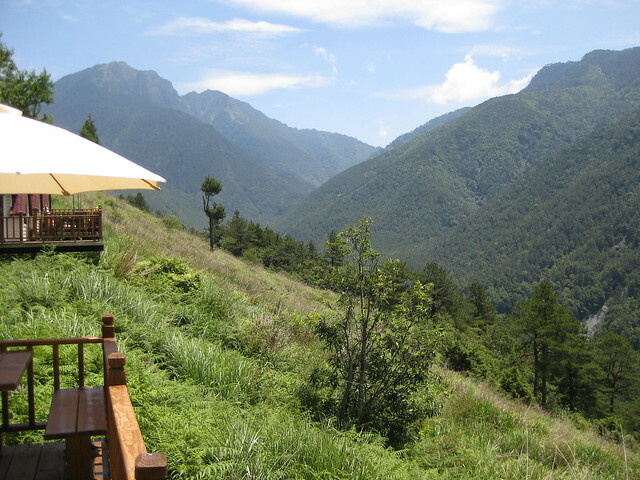 To compensate partly, I found Internet being provided in Taipei san wen nahs (saunas). Except the Internet provided used Chinese Operating Systems. And besides, I rather soak in 44 C hot pools, or chill in 22C swimming pools or really chill out in 5 C chilling pools, followed by good meals in the luxurious dining areas followed by another dip in the hot pools. As arranged with Chen Hung, I met him at 7am at Mucha MRT station. 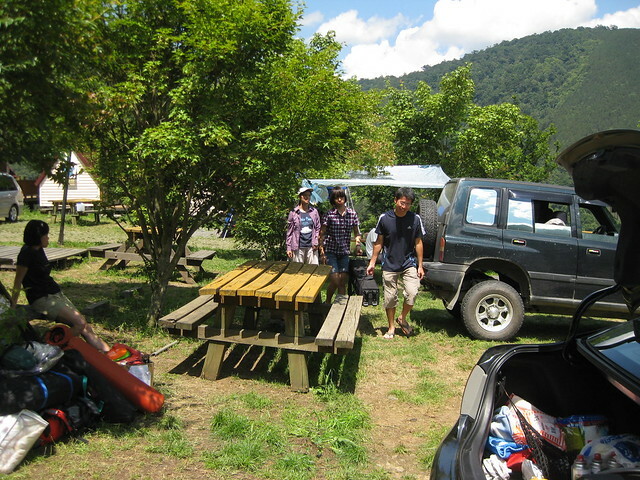 And see his wife and his 2 kids in a car packed with camping gears and stuff. 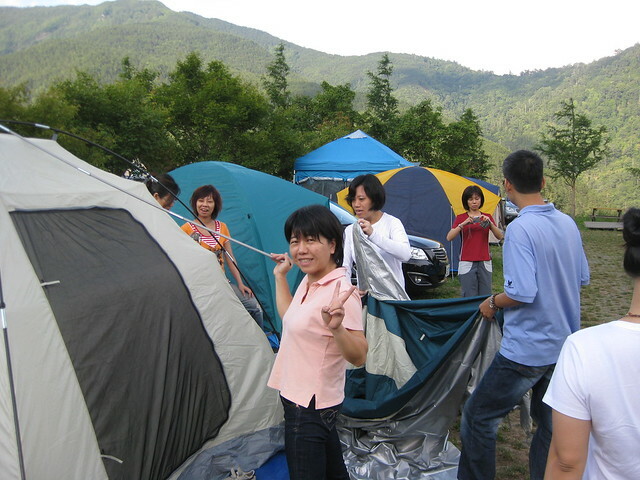 The last time we met in Taiwan was in Apr 2008 when I and my wife got back to see Tinkerbell after that big scare at BanTienYen at end 2007. 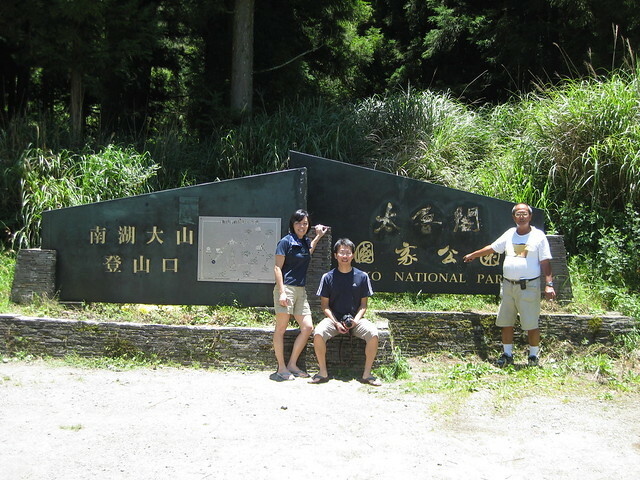 We arranged to meet CH at Taroko Gorge. We did meet. Except that I had been terribly ill at that time with a bad bug. In one of the most beautiful places on Earth, I was largely in bed. There had been moments when I was ok with good vivid memories. But I drifted in and out of consciousness. 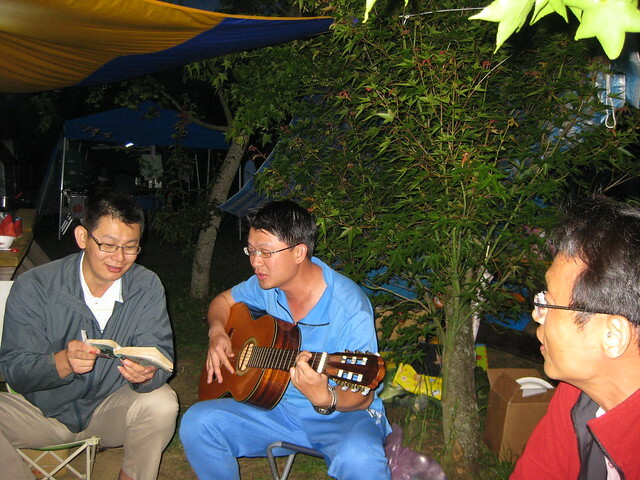 The journal entry made http://shanlung.livejournal.com/2008/05/15/ was only partial. 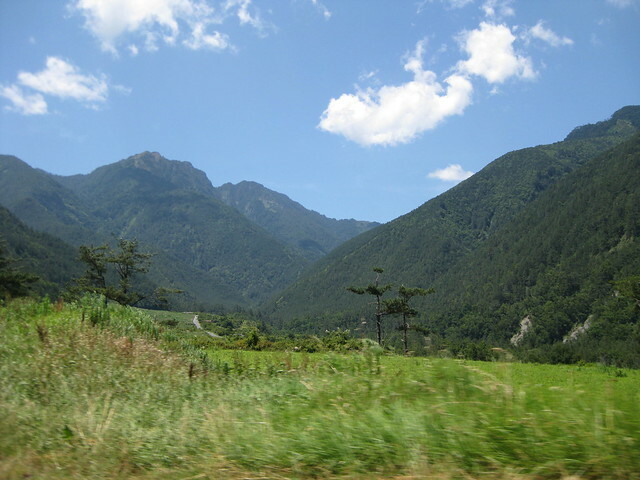 I could hardly write on that travel continuing to Taroko and meeting of CH and family and other friends when I was drifting in and out of consciousness. 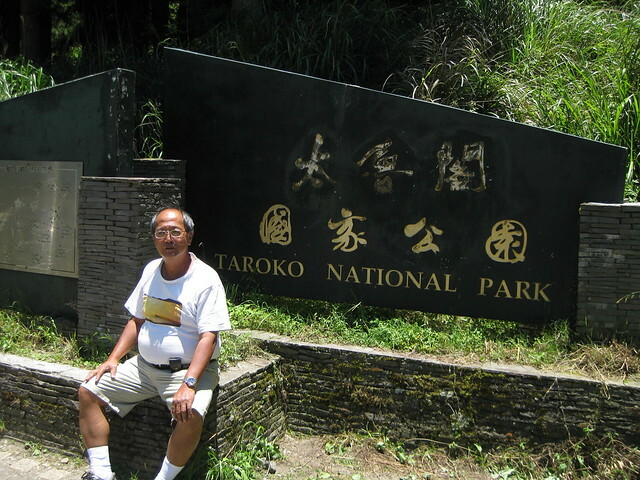 I recovered only about at the end of the visit to Taroko. I was also then just in Dubai and transitioning was always difficult. Addiction to chess did not help either. I regret not writing the little that I could have written. As sadly what I had not write will be covered by the mist of time and lost to me. The tunnel linking Taipei to Yilan was finally completed. The tunnelmore had to go through horrendous geology and underground rivers. 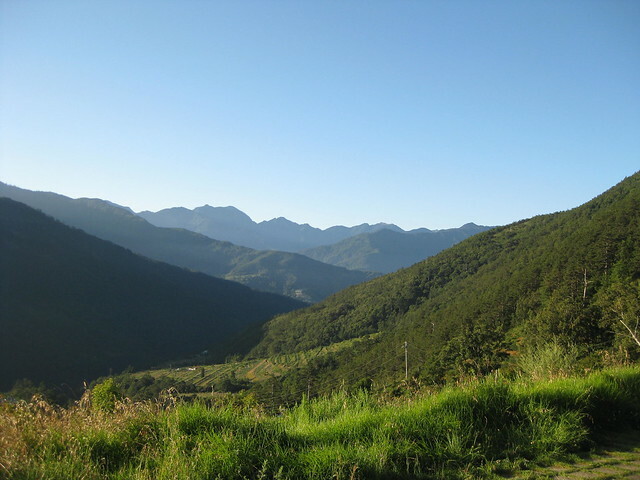 A long tiring 3-4 hours drive across winding mountain roads became a smooth 30 minutes ride. At Luodon we had breakfast. And decided to explore a little park there. 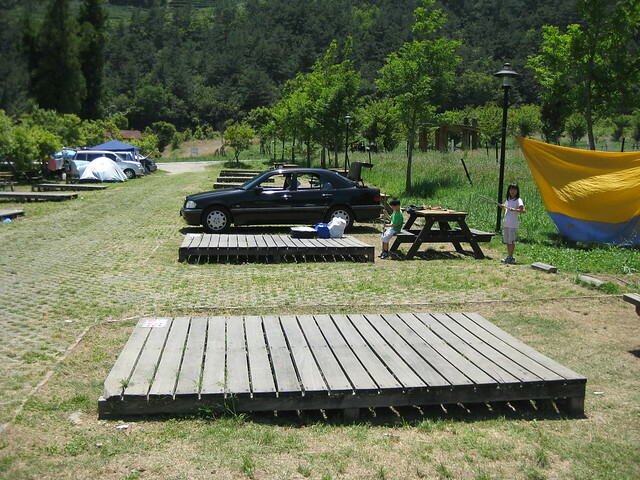 That was formerly an old Japanese forest camp set up to harvest and process timber. 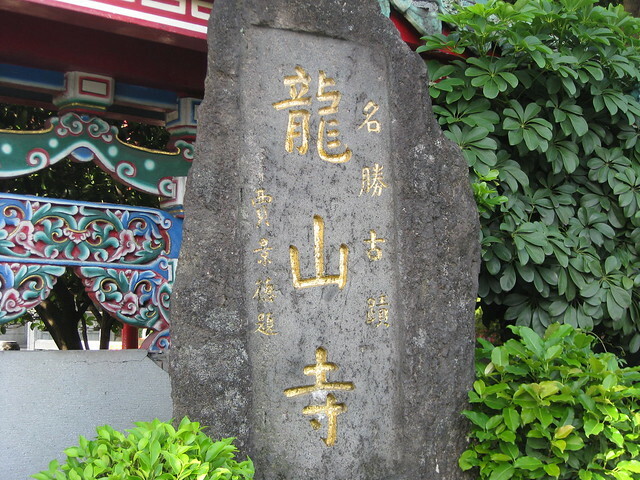 An interesting bit of Taiwan history. 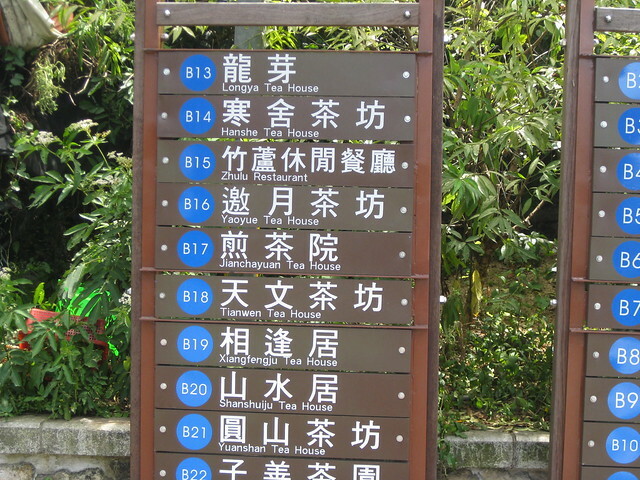 Unlike South Korea where I was in where the Koreans hated Japanese with a vengence, Taiwanese retained an affection for Japanese. Apparently the Japanese was very firm and fair in their colonial control of Taiwan. I recalled my friends parents singing in Japanese when they were drunk. 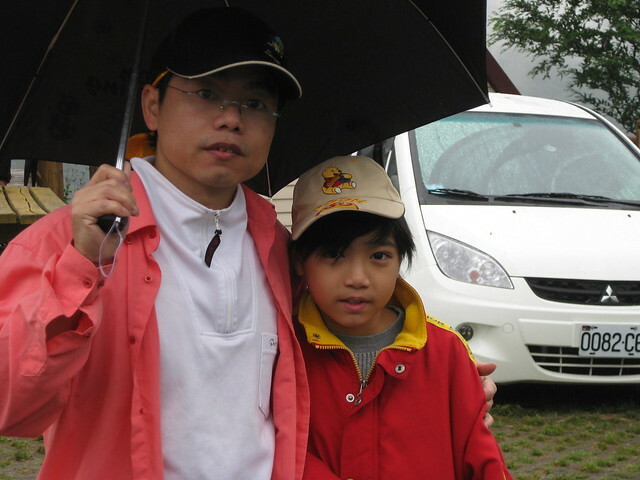 In the recent earthquake and tsunami that hit Japan, people of Taiwan gave huge amount of aid to Japan. 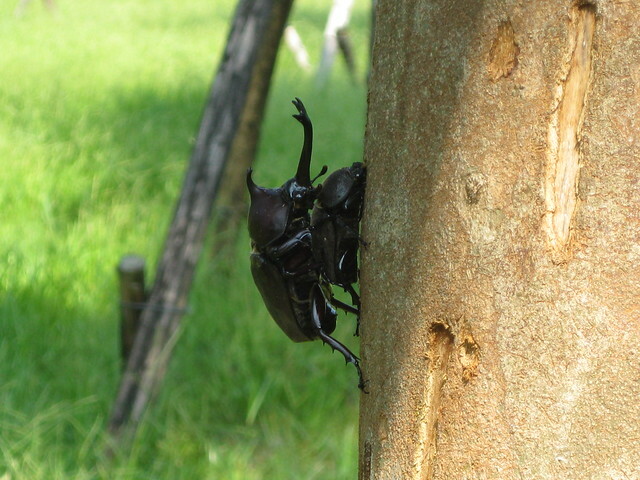 In the park, rhinocerous beetles were swarming on the tree. Huge males were tossing little males off the tree. So that they can mate with the females. Then we headed on. Passing little towns as we went on the road up the mountain. Stopping now and then to pick up local delicacies. 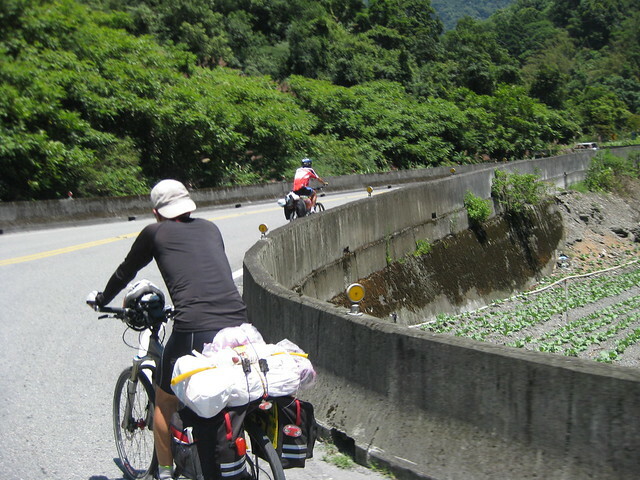 I smiled as we passed the cyclists cycling up and up that mountain road. We waved and shouted encouragements to them. I smiled more as I recollect the time I cycled on that road. Except I headed the other way, down from top of mountain. I found cycling down is a lot less stressful than cycling up. 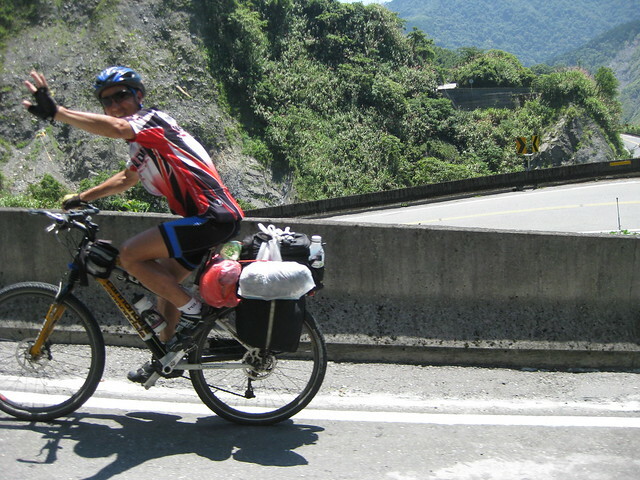 So in 2003, I drove to Wuling Non Chang with my mountain bike strapped to rack of the car. And I rode the bike down. That same Giant Iguana I fell off from a few weeks ago. It was a lot cooler as we went higher up. I found it profoundly sad that with such beautiful scenery, power cables were about everywhere. If you complain of the cable in above photo, that shot was sneaked in between half dozen of such cables. 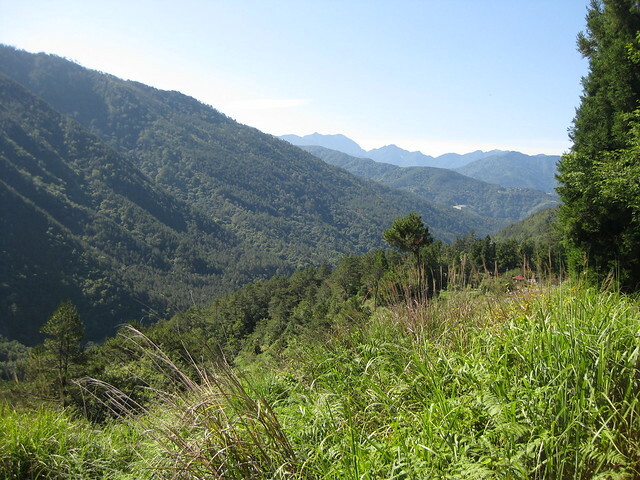 It was with greatest pleasure to be back in Wuling Nong Chang again after ten years. 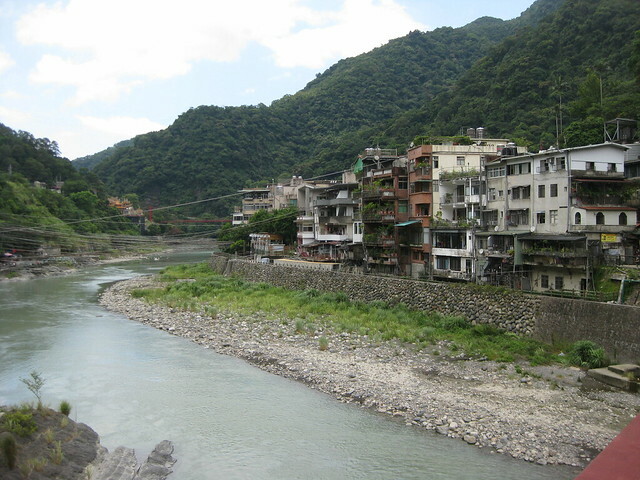 When Chiang Kai Shek lost the fight to Mao Tse Tung, he fled to Taiwan with his army. 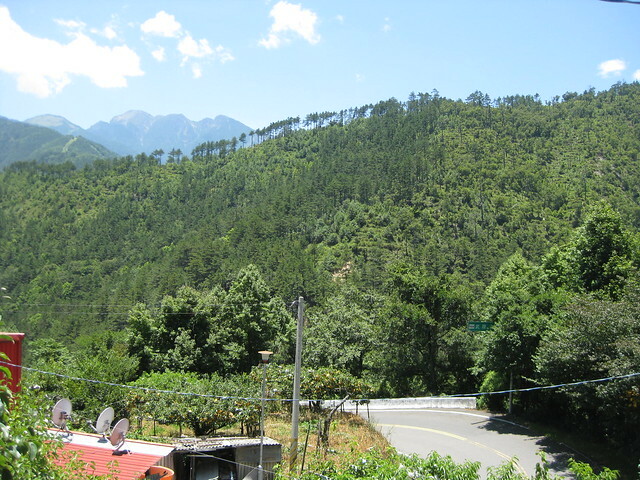 Later on this valley was designated as a fruit growing and farming area for his soldiers. 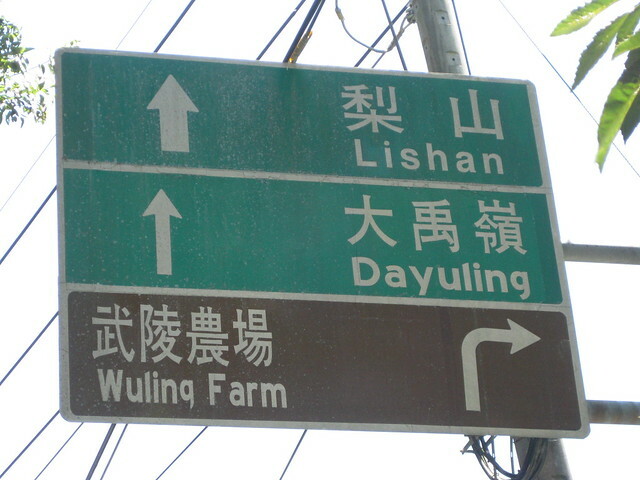 The Wu 武 in the 武陵 Wuling meant military and the NongChang meant farm. Forest on the side was cut and the siltation on the creek must have been terrible then. See how heavy the trees and vegetation was in the pboto from the very sparse vegetation I last saw that area. That was 10 years ago. 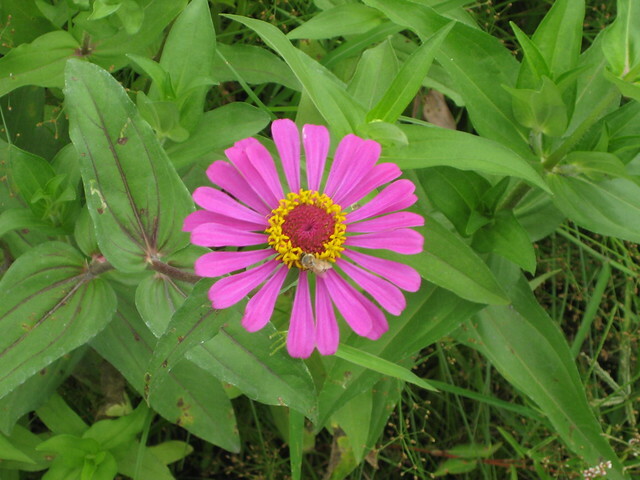 The decision was made then to return the area back to the wild. Trees were just planted and it was largely bare ground then. 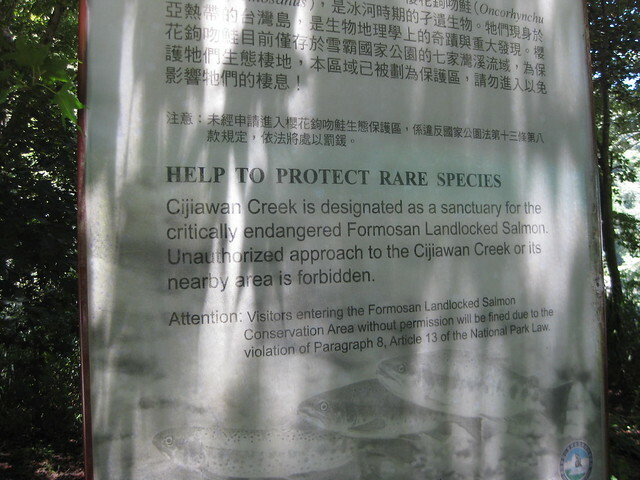 The stream in photo above had the Taiwan land locked salmon which nearly went extinct until they realised how rare that was and went into frenzy to try to save that salmon. 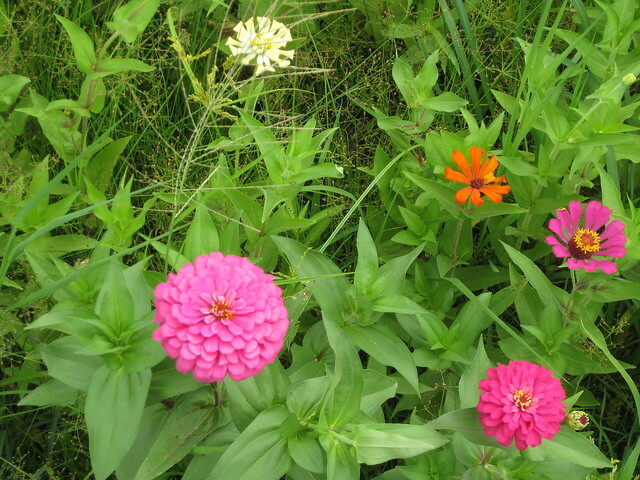 I am happy to report they succeeded and reversed the damages earlier inflicted. 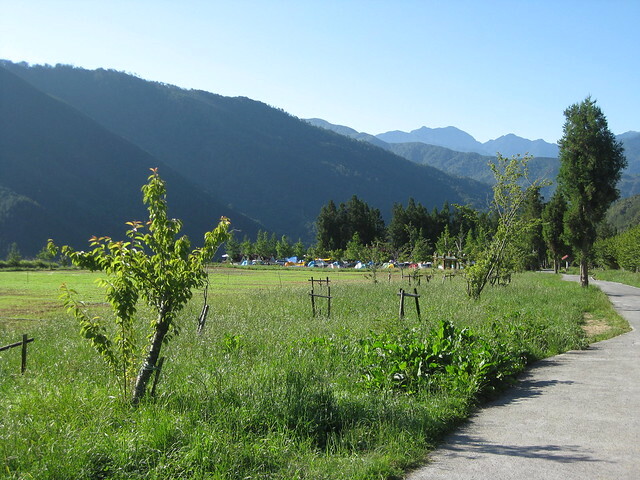 We drove on and higher up and entered the meadow area where the camp site was, surrounded with beautiful mountains all around us. 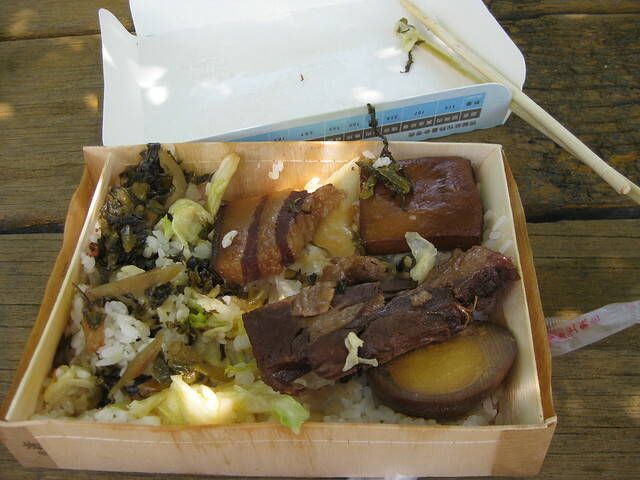 We had lunch from the bian tan lunch boxes. Below was mine with yummy fatty pork as the main. 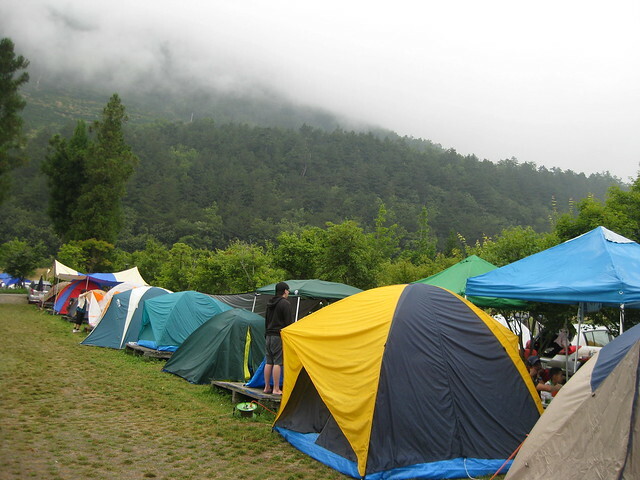 Shelters and tents were all unpacked and erected. 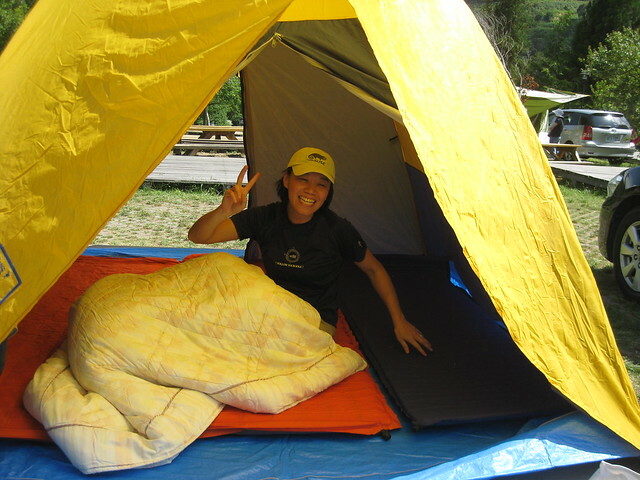 Luxury upon luxury, even comforters were used in camping now as seen in above photo of Mrs CH. I told her that if my wife known comforters were used in camping, she would have withdrawn objections to camping. I forgot with cars camping can be very different from the days when I backpacked tent and stuff and weight had to be kept to minimum. 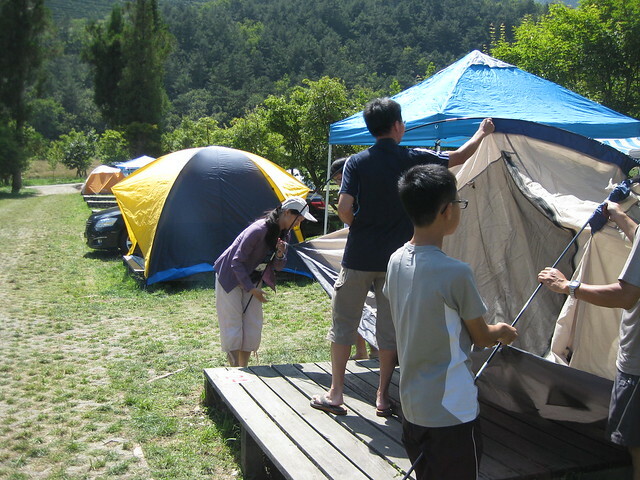 As the advance party, we got tents and pavilion up first. And could relax a bit. CH then showed me on his Ipad some old photos of us. I was delighted as those photos showed a much younger me. With head full of black hairs and my chest larger than my stomach. Above taken in summer 1991. CH was in training for iron man contest after I worked with him how to swim. He was going to do a sea crossing of a bay. I was going to be his safety with my fins. 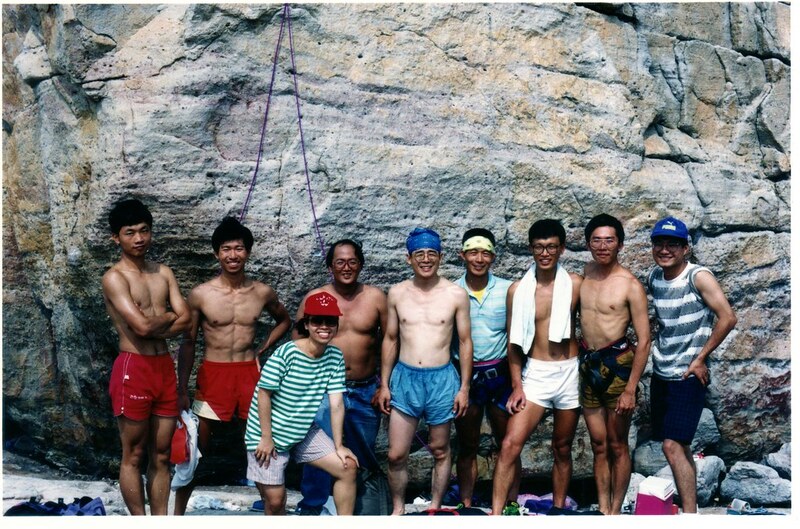 Yet another old photo of 1991 where we were at LungTung (Dragon Cove) doing rock climbing and traversing. Scary now when I think back of that. No safety harnesses and lines. Luckily we were all super fit and gods smiled on us all then. Slowly the rest came in. Many I had not seen for twenty years. 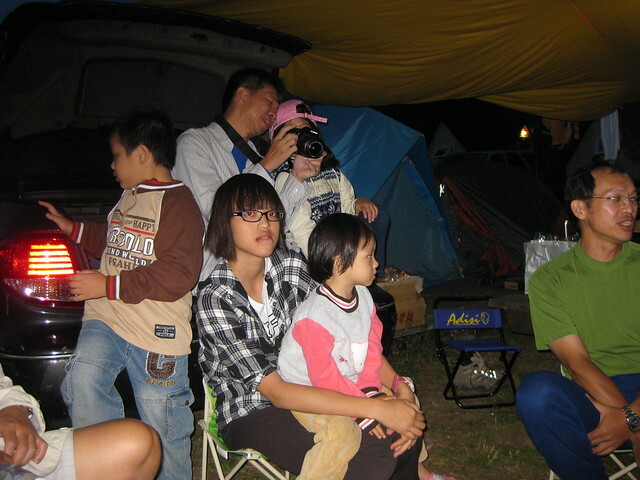 With beautiful kids in tow and setting up their tents and getting comfortable. 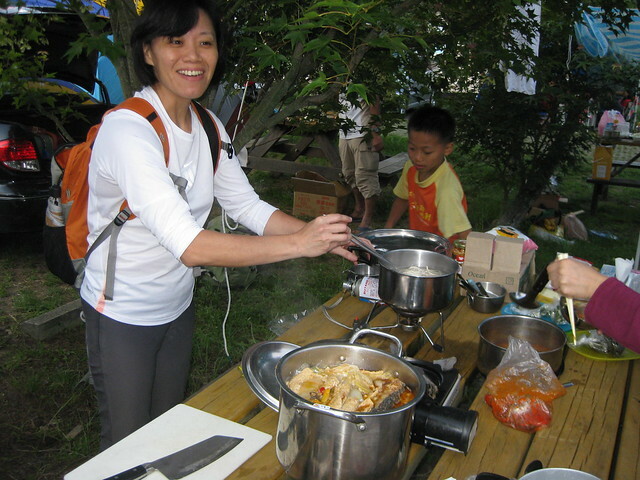 Followed by cooking pots and food and more food. 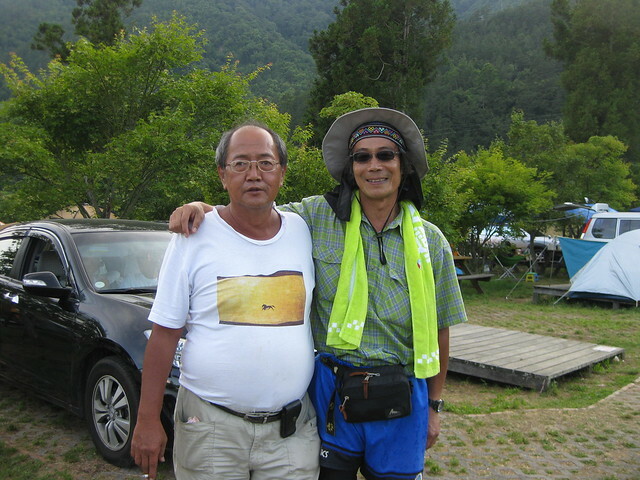 with Chen Laoshi, the sportmaster of that university of CH of which I am an hononary member of. I was so happy to see him well as 7 years ago, I was told he was so close to death from a sporting accident. 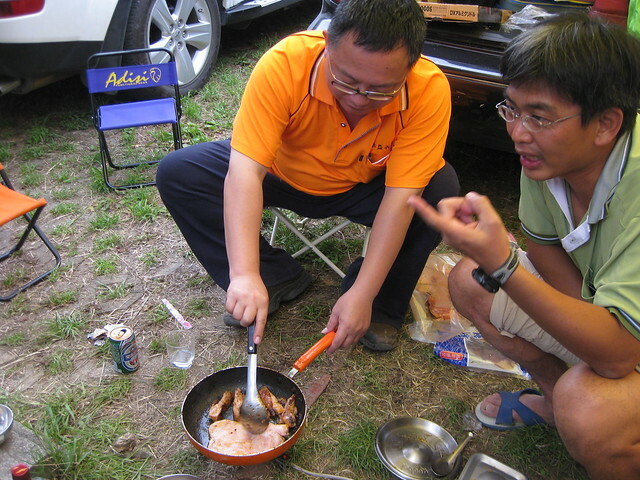 No end of food and more food, wonderful delicacies of Taiwan prepared with love and joy. 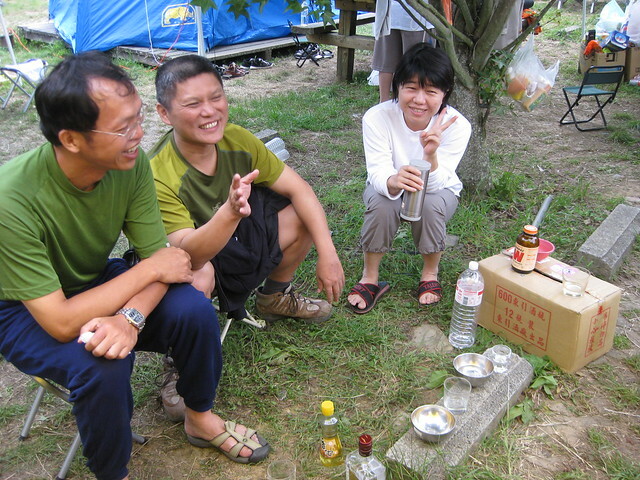 We ate, we drank Kaoliang liquor, and we ate, and we talked, and we laughed, just being happy together again. 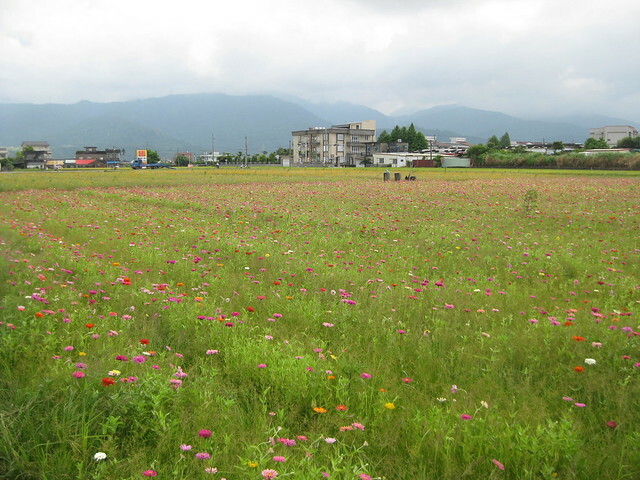 On their annual get together on a meadow of Wuling NongChang. 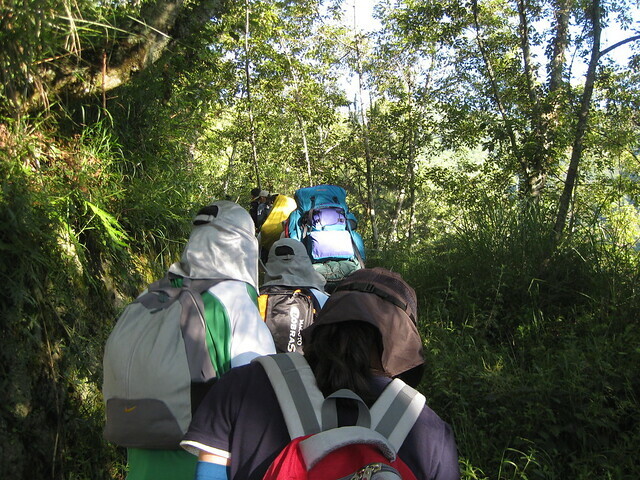 This was going to be the day of the mountain climb. Syue Shan or Snow Mountain was going to be tackled by us. 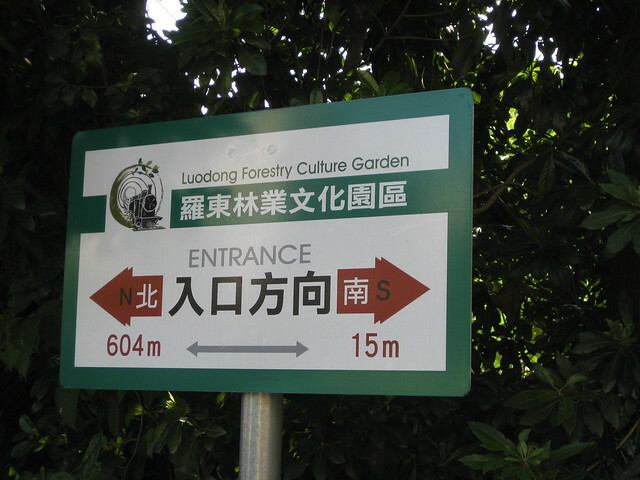 Those who were fit were going to go to the Eastern Peak about 3 hours away. Those not so fit and not inclined were going to viewing area an hour or so away to wait for the first group to come on down together. 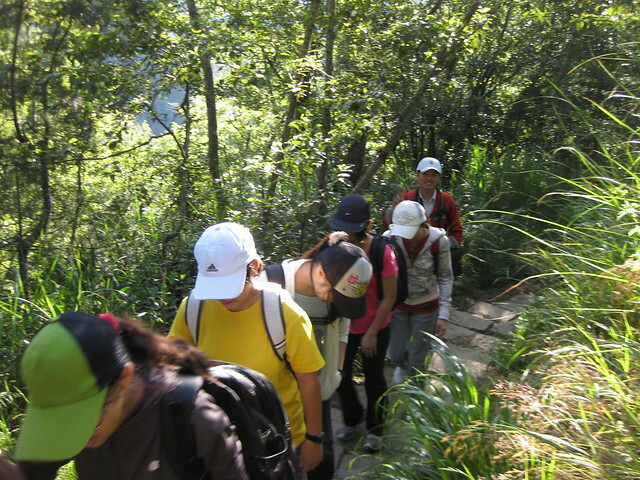 The superfit, consisting of Chen Laoshi and 2 girls were going to do a 3 day hike to the main peak. We drove up to the trail head, about a couple of klicks from the camp. 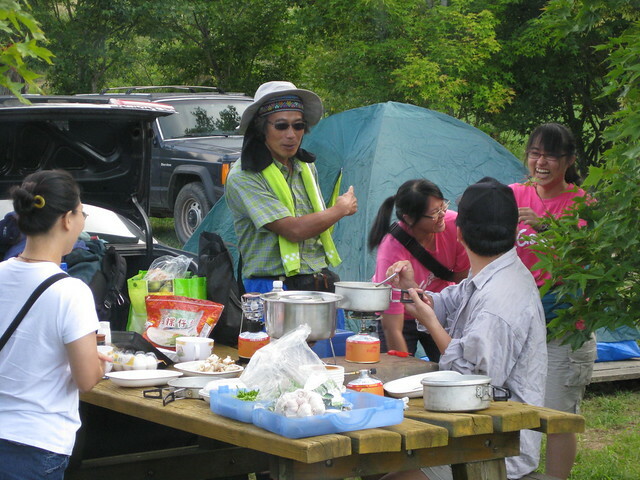 See Chen Laoshi with his heavy backpack of food and stuff for 3 days. We then started off. I knew I would not go the 3 hour route and would be content with the short hour to viewing area. I figured with 2 good limbs consisting of a good right arm and an ok left leg that I tested at YangMingShan I should be able to do it. My wonky right leg needed the ok left leg to do the work. 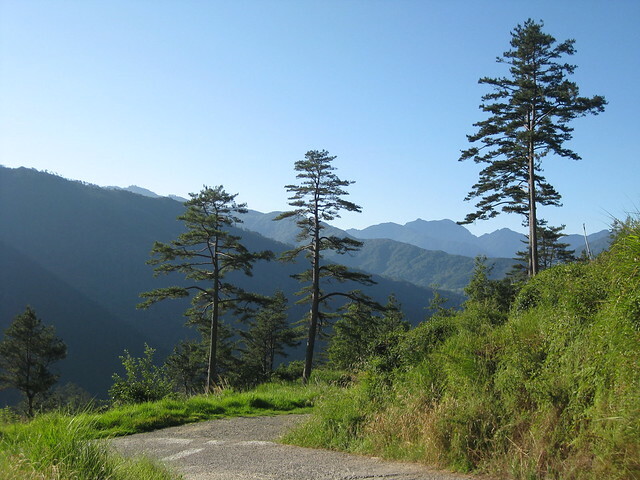 The trail from trailhead went up the mountainside sharply via paths of cobbled stone steps. What I thought was an ok left leg immediately told me otherwise. 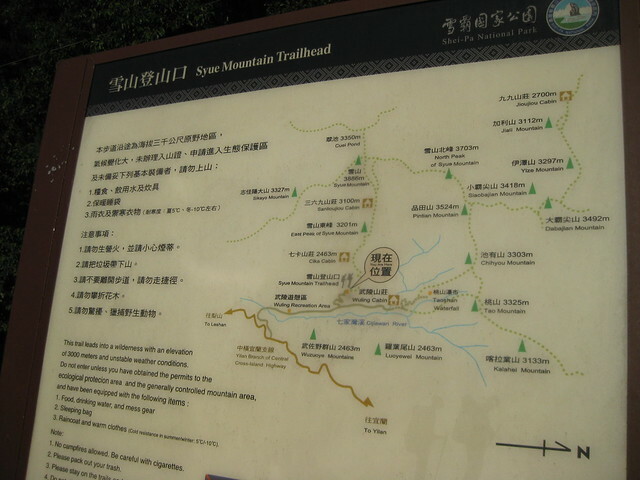 Leg good for the fairly level path that I took in YangMingshan was not good for steps. I ignored the creaking from my knee for 100 meters or so. I then realised that I only have one good limb, my right arm to do that one hour of climb. If I fell, even on the path, I could hurt myself badly. I was very adverse to pain. My friends would rescue me and take me down. But would it be fair to them that I might ruined that day for them? I went on another 50 meters. 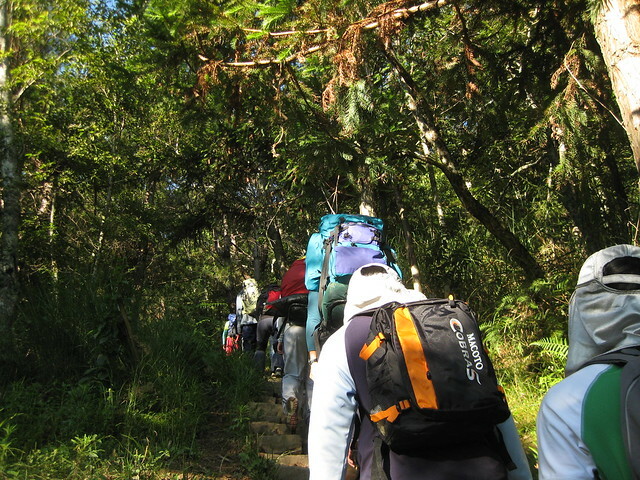 My left leg complained more and more with each step upwards. I knew I could not do it. CH was at the end of the group. I told him I was not going to make it and that I will be walking down back to the camp site. Those interested with the climb taken by him and others can see his photos here. Together with photos of myself and the camp from his camera. I did a slow walk back to the camp. Even if I could not join the rest of them, it was still a beautiful day and I was in such a beautiful place. I sat around and finished my Red seas by Scott Lynch. In time, they all came back to the camp. I thought yesterday a huge amount of food and drink was consumed. I was mistaken. 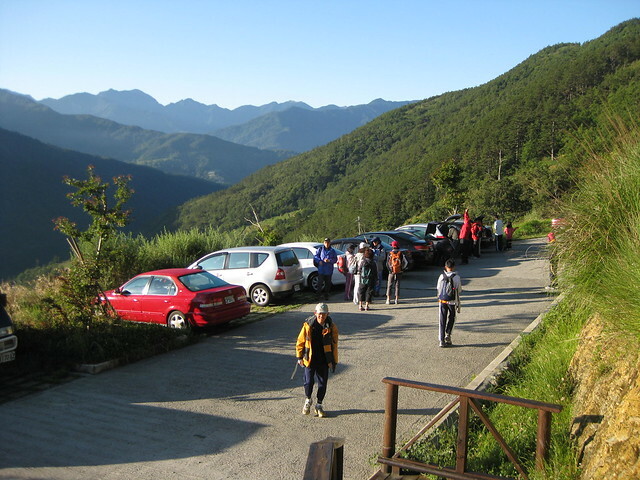 After a good climb and back, folks became hungrier and more thirsty. By 4 pm it started. We ate, we toasted each other one and all, we ate, we drank and we sang till late into the night. It was a cloudy morning. With periodic showers. Not as if we all could complain. After all, we had two wonderful days earlier, when weather forecast told us it would be raining heavily during those 2 days. 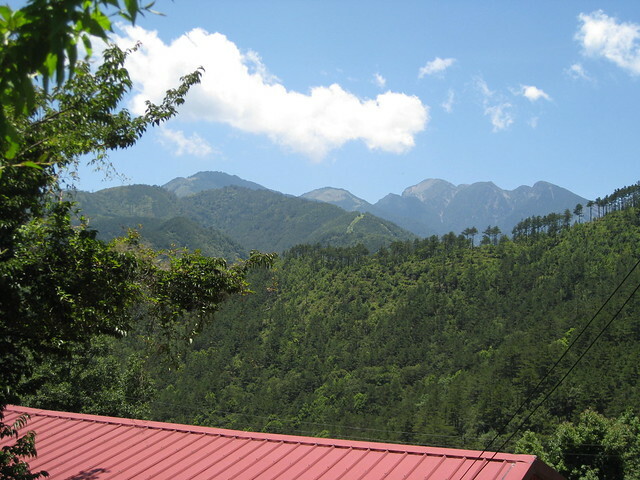 Normally the weather forecasts were accurate in Taiwan, but not for those 2 days. Clouds rolling in hide the top of the mountains. Giving a dreamy mystical feel to that area. Breakfast were made and eaten. Tents taken down and area cleared. To the cleanliness and state when we first came in. All done naturally and with care by all. I remembered the times I had picnics with my wife in Oman and at all times, I fumed at the rubbish left by others in those pristine areas. But we were all packed and ready to roll. We were going to Suao for very late lunch. We drove down to meet sunshine again. 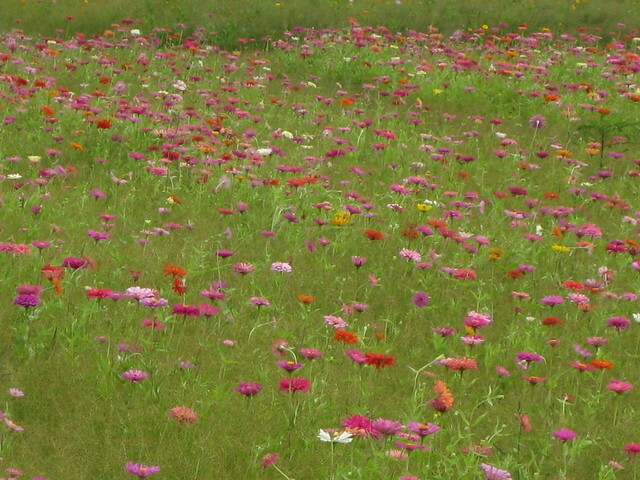 To pass through fields of assorted wild flowers. An unexpected but a welcomed sight. My request to host that lunch was rejected. Tried as I did over the last few weeks, I never managed to pick up the bill. 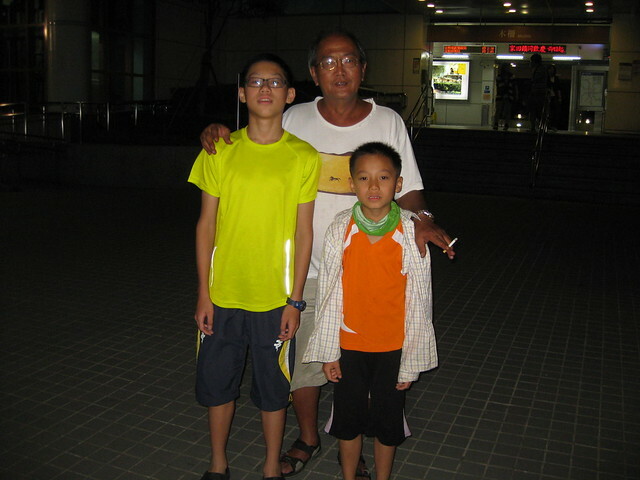 I was dropped off where they picked me up 3 days ago, at the Mucha MRT station. After hugs to and from CH and his family, I waved my goodbyes to all of them. 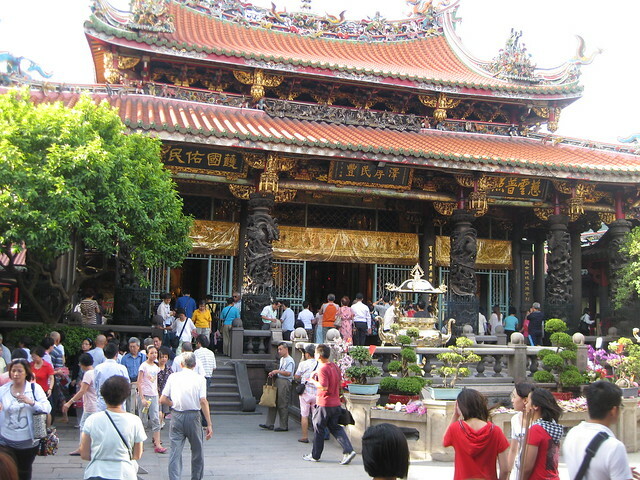 I spend the time in revisiting some of the places around Taipei that I liked. 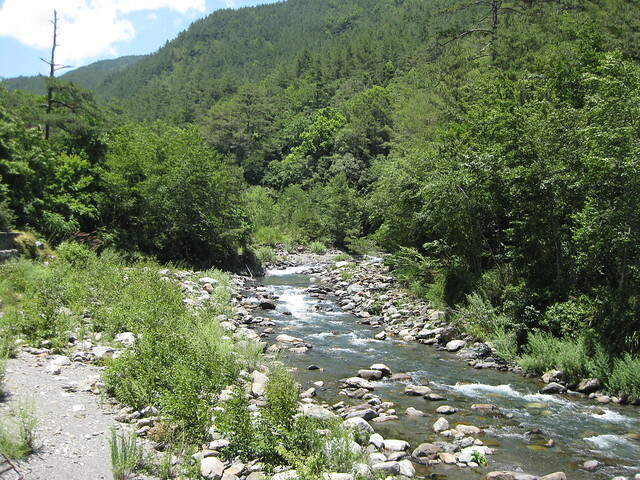 Such as hotsprings in Wulai. And to eat the food there. It might be more appropriate to enjoy the hotsprings in winter. But I was there, and went for a soak just to enjoy it. I visited the beef noodle proprietor in Rayfang and had dinner there. The monk did not come to see me as he did 20 years ago. The next day I said hello to the 2 giant pandas in Taipei Zoo. They were more intent on sleeping than to return my greetings. 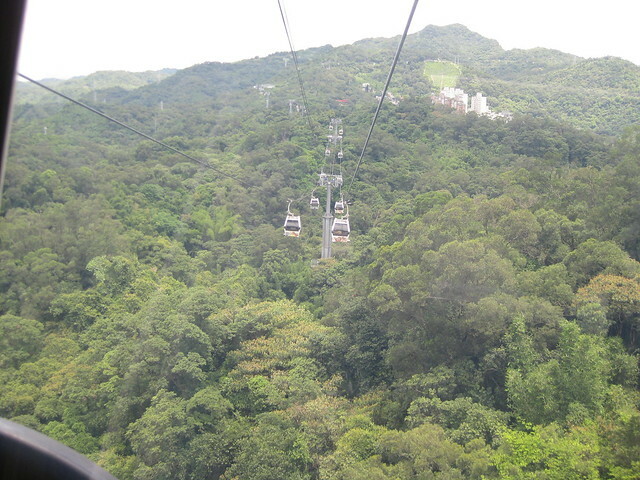 Then a ride on the MaoKong gondolas to top of nearby hills of Mucha. 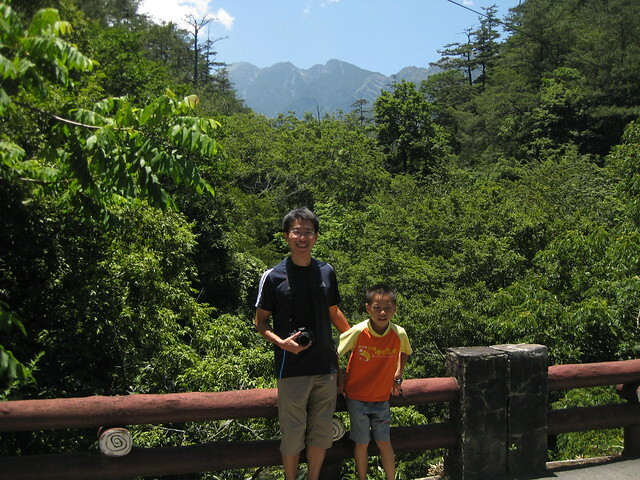 Then a visit to LungShan Tse or Dragon Mountain Temple, almost like my name of ShanLung or Mountain Dragon. And a video of the chanting and prayers inside that temple. And the next day, 13th July 2011, my trip to Taiwan and Tinkerbell Summertime2011 came to an end as I board my flight back to Singapore.